Stainless Outfitters is the original supplier to such well known names as Hinterhoeller Yachts, builders of Nonsuch, C&C Yachts, Bombardier Aerospace, M.D.S. Nordion, Toronto Parks and Recreation, The Ontario Provincial Police, plus many more. Commercial and residential rails have always been a part of our expertise, but perhaps not as well publicized as our marine products. Trade show rails and exhibit structures are another facet of our versatility at Stainless Outfitters. Working with well-known local artist, Mr. Ron Baird, Stainless Outfitters has created a number of art pieces. Proud to offer over 30 years in the design and manufacture of quality stainless steel products. At Stainless Outfitters Inc., we manufacture and design a variety of different stainless steel products for various industries. For instance, we produce yacht railings, ladders, and anchor rollers for the marine industry, as well as handrails, stair railings, range hoods, and designer kitchen accents for those who are in the field of architecture. We also serve the industrial industry and produce quality stainless steel products for customized projects. Our stainless steel products deliver immense value to any project and positively represent our 30 years of experience serving the area. We have acted as the original stainless steel supplier to many well-known brands and organizations, including Toronto Parks and Recreation, the Ontario Provincial Police, C&C Yachts, Hinterhoeller Yachts, Best Theratronics and many more. Any of our past and present clients can attest to the quality of our stainless steel products and the impressive level of service we provide. 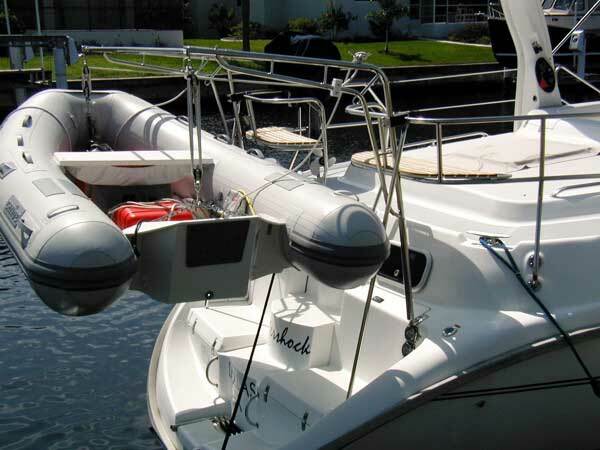 We manufacture top-quality stainless steel products, including anchor carriers, boat ladders, and stainless stemheads. We have been designing and manufacturing stainless steel products for over 30 years. The main thing that sets our stainless steel products apart is that we use raw materials of the highest quality. These raw materials are produced right here in North America, and the suppliers we work with maintain proper material certifications to ensure that the stainless steel we use provides maximum resistance against corrosion. From concept to reality, our mission is to meet design challenges with excellence and manufacture durable, quality stainless steel products for every one of our clients. For more information about our products, services, or our capabilities, please call us at Stainless Outfitters Inc. today at 800-268-0395.